The Golden Mask of King Tutankhamen (Photo by Bj�rn Christian T�rrissen licensed under the Creative Commons Attribution-Share Alike 3.0 Unported license). The rumor of an ancient curse didn't stop this archaeologist from opening the tomb of King Tut. The king was only nineteen when he died, perhaps murdered by his enemies. His tomb, in comparison with his contemporaries, was modest. After his death, his successors made an attempt to expunge his memory by removing his name from all the official records. Even those carved in stone. As it turns out, his enemy's efforts only ensured his eventual fame. 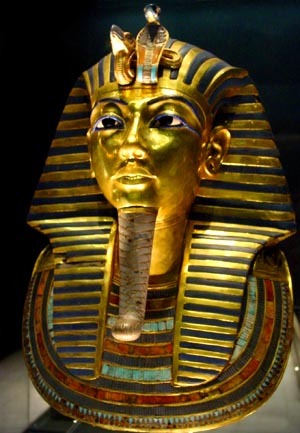 His name was Tutankhamen: King Tut. The ancient Egyptians revered their Pharaohs as Gods. Upon their deaths the King's bodies were carefully preserved by embalming. The mummified corpses were then interned in elaborate tombs (like the Great Pyramid) and surrounded with all the riches the royals would need in the next life. The tombs were then carefully sealed. Egypt's best architects designed the structures to resist thieves. In some cases heavy, hard-granite plugs were used to block passageways. In others, false doorways and hidden rooms were designed to fool intruders. Finally, in a few cases, a curse was placed on the entrance. Most of these precautions failed. In ancient times grave robbers found their way into the tombs. They unsealed the doors, chiseled their way around the plugs and found the secrets of the hidden rooms. They stripped the dead Kings of their valuables. We will never know if any of the thieves suffered the wrath of a curse. As for anybody who shall enter this tomb in his impurity: I shall ring his neck as a bird's. As for any man who shall destroy these, it is the god Thoth who shall destroy him. As for him who shall destroy this inscription: He shall not reach his home. He shall not embrace his children. He shall not see success. Archaeologists from Europe became very interested in Egypt in the 19th century. They uncovered the old tombs and explored their deep recesses always hoping to find that one forgotten crypt that had not been plundered in antiquity. They knew that the Pharaohs had been buried with untold treasures that would be of immense artistic, scientific, and monetary value. Always the archaeologists were disappointed. In 1891 a young Englishman named Howard Carter arrived in Egypt. Over the years he became convinced that there was at least one undiscovered tomb. That of the almost unknown King Tutankhamen. Carter found a backer for his tomb search in the wealthy Lord Carnarvon. For five years Carter dug looking for the missing Pharaoh and found nothing. Carnarvon summoned Carter to England in1922 to tell him he was calling off the search. Carter managed to talk the lord into supporting him for one more season of digging. Returning to Egypt the archaeologist brought with him a yellow canary. "A golden bird!" Carter's foreman, Reis Ahmed, exclaimed. "It will lead us to the tomb!" Perhaps it did. On November 4th, 1922 Carter's workmen discovered a step cut into the rock that had been hidden by debris left over from the building of the tomb of Ramesses IV. Digging further they found fifteen more leading to an ancient doorway that appeared to be still sealed. On the doorway was the name Tutankhamen. It is said that when Carter arrived home that night his servant met him at the door. In his hand he clutched a few yellow feathers. His eyes large with fear, he reported that the canary had been killed by a cobra. Carter, a practical man, told the servant to make sure the snake was out of the house. The man grabbed Carter by the sleeve. "The pharaoh's serpent ate the bird because it led us to the hidden tomb! You must not disturb the tomb!" 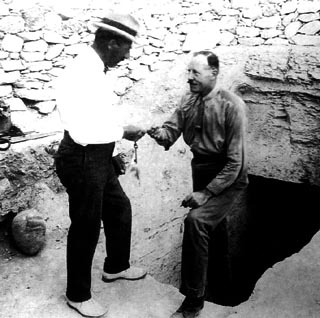 Carter and Lord Carnarvon at the entrance of the tomb in 1922. Scoffing at such superstitious nonsense, Carter sent the man home. Carter immediately sent a telegram to Carnarvon in England and waited anxiously for his arrival. Though under close inspection it appeared that the outer sections of the tomb had been entered in ancient times, the door to the innermost part of the tomb still seemed to be intact. Carnarvon made it to Egypt by November 26th and watched as Carter made a hole in the door. Carter leaned in, holding a candle, to take a look. Behind him Lord Carnarvon asked, "Can you see anything?" Carter answered, "Yes, wonderful things." The day the tomb was opened was one of joy and celebration for all those involved. Nobody seemed to be concerned about any curse. 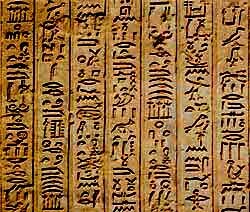 Rumors later circulated that Carter had found a tablet with the curse inscribed on it, but hid it immediately so it would not alarm his workers. Carter denied doing so. The tomb was intact and contained an amazing collection of treasures including a stone sarcophagus. The sarcophagus contained three gold coffins nested within each other. Inside the final one was the mummy of the boy-king, Pharaoh Tutankhamen. A few months after the tomb's opening tragedy struck. Lord Carnarvon, 57, was taken ill and rushed to Cairo. He died a few days later. The exact cause of death was not known, but it seemed to be from an infection started by an insect bite. Legend has it that when he died there was a short power failure and all the lights throughout Cairo went out. His son reported that back on his estate in England his favorite dog howled and suddenly dropped dead. Even more strange, when the mummy of Tutankhamun was unwrapped in 1925, it supposedly was found to have a wound on the left cheek in the same exact position as the insect bite on Carnarvon that lead to his death. By 1929 eleven people connected with the discovery of the Tomb had died early and of unnatural causes. This included two of Carnarvon's relatives, Carter's personal secretary, Richard Bethell, and Bethell's father, Lord Westbury. Westbury killed himself by jumping from a building. He left a note that read, "I really cannot stand any more horrors and hardly see what good I am going to do here, so I am making my exit." The press followed the deaths carefully attributing each new one to the "Mummy's Curse" By 1935 they had credited 21 victims to King Tut. Was there really a curse? Or was it all just the ravings of a sensational press? Herbert E. Winlock, the director of the Metropolitan Museum of Art in New York City, made his own calculations about the effectiveness of the curse. According to Winlock's figures of the 22 people present when the tomb was opened in 1922, only 6 had died by 1934. Of the 22 people present at the opening of the sarcophagus in 1924, only 2 died in the following ten years. Also ten people were there when the mummy was unwrapped in 1925, and all survived until at least 1934. 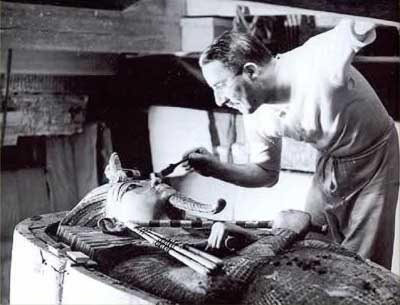 Carter works with the Tut coffin: No mask in those days. In 2002 a medicine scholar at Monash University in Melbourne, Australia, named Mark Nelson, completed a study which purportedly showed that the curse of King Tut never really existed. Nelson selected 44 Westerners in Egypt at the time the tomb was discovered. Of those, twenty-five of the group were people potentially exposed to the curse either because they were at the breaking of the sacred seals in the tomb, or at the opening of the sarcophagus, or at the opening of the coffins, or the unwrapping of the mummy. The average age of death of the group that was "exposed" to the curse was 70 years. The average survival rate for those not exposed was 75. This might seem like the curse may have had an effect, but statistically, given the small size of the groups, the difference isn't significant. Many of the stories surrounding the curse are also without foundation. Carter's canary was never eaten by a snake (but given to a friend). As for the lights going out all over Cairo at Lord Carnarvon death, power failures in Cairo in 1923 were a common occurrences and a supernatural cause is hardly needed to explain them. Even the Lord's demise seems hardly inexplicable in itself as he was already known to be in poor health before the opening of the tomb, and infections, especially in the days before the invention of antibiotics, were a common cause of death. Perhaps, the power of a curse is in the mind of the person who believes in it. 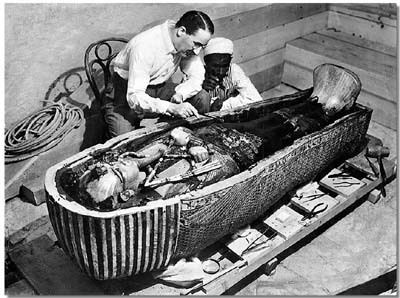 Howard Carter, the man who actually opened the tomb, never believed in the curse and lived to a reasonably old age of 64 before dying of entirely natural causes. Was the Curse Actually a Fungus? Carter with the sarcophagus of the boy king. Several people have suggested that illnesses associated with the ancient Egyptian tombs may have a rational explanation based in biology. Dr. Ezzeddin Taha, of Cairo University, examined the health records of museum workers and noticed that many of them had been exposed to Aspergillus niger (black mold), a fungus that causes fever, fatigue and rashes. He suggested that the fungus might have been able to survive in the tombs for thousands of years and then was picked up by archaeologists when they entered. Dr. Nicola Di Paolo, an Italian physician identified another possible fungus, Aspergillus ochraceus, at Egyptian archaeological sites suggesting it might also have made visitors to the tomb, or even those that just handled artifacts from the tombs, sick. Aspergillus ochraceus has not been shown to be fatal, however. In 1999 a German microbiologist, Gotthard Kramer, from the University of Leipzig, analyzed 40 mummies and identified several potentially dangerous mold spores on each. Mold spores are tough and can survive thousands of years even in a dark, dry tomb. Although most are harmless, a few can be toxic. Kramer thinks that when tombs were first opened and fresh air gusted inside, these spores could have been blown up into the air. "When spores enter the body through the nose, mouth or eye mucous membranes, " he adds, "they can lead to organ failure or even death, particularly in individuals with weakened immune systems." These days archaeologists wear protective gear (such as masks and gloves) when working in a tomb or unwrapping a mummy (though more because of dust than fear of germs) something explorers from the days of Howard Carter and Lord Carnarvon didn't do. As much as the theories involving mold spores have often appeared in the popular press, researchers have had a hard time tracing any death - including Lord Carnarvon's - back to a microorganism coming from a mummy or a tomb. In fact, F. DeWolfe Miller, professor of epidemiology at the University of Hawaii wryly observed, "Given the sanitary conditions of the time in general, and those within Egypt in particular, Lord Carnarvon would likely have been safer inside the tomb than outside." So was the curse of the mummy a mold spore named Aspergillus flavus or ochraceus? Or was the whole thing just media hype? Book "The Murder of Tutankhamen: A True Story"
Copyright Lee Krystek 1997-2012. All Rights Reserved.